"Hey there! Are you looking for a big cat with a big personality? Well look no further! They call me Big Hughes for just those reasons. I came to Wayside from another shelter where I was picked up as a stray. When I came in it was found that my right eye had been damaged early in my life and I had little vision. In order to prevent further problems and pain for me, the good doctors decided it was best to remove it." "So here I am, a handsome, red tabby one-eyed wonder! While I was recovering I got to stay in a foster home. I had so much fun and got to show off my playful, confident personality. My favorite thing in the whole world is playing! I am not picky with what I play with, mouse toys, jingly balls, tennis balls...I love them all! Sometimes when I'm having SO much fun playing, I forget my manners and can nip. I don't mean to be rude, but I still have a lot of kitten ways inside and sometimes they come out. I got along with the other cats in my foster home, but sometimes my playful antics drove them a bit crazy." Playin' hard requires NAPPIN' hard, too! "I definitely need someone who can keep up with me! I also love to talk and would love to tell you all about me if you'll come on down to Wayside Waifs! When the day is done and I'm all played out, I love to snuggle and have my belly rubbed. Could you be my special play mate? If you think so, come and have a conversation with me! He will also huff when he's highly stimulated, which happens when he interacts with other cats for the first time. 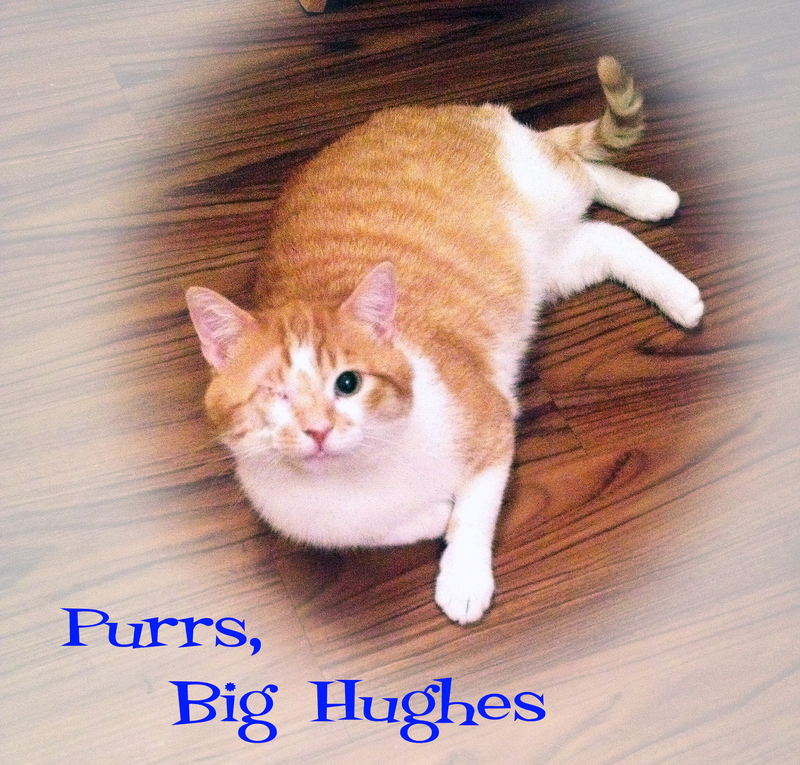 Big Hughes is a One-eyed LOVER boy and is revved up and ready to go to his forever home. If you're interested, he's waiting for you at Allie's Alma Mater, Wayside Waifs! Big Hughes, you're a handsome guy. I hope you find your perfect forever home where someone will play with you and give you lots of love. Big Hughes sounds like a really fun guy - AND how cool that he's also leash trained! How sweet and we wish him the best of luck. Have a wonderful Wednesday. OMC, what a handsome guy. We have such a soft spot for one-eyed kitties, of course. We'll share him on Twitter. He sounds like such a pawesome kitty! I hope he finds his forever home soon and maybe a feline playmate to keep him entertained while his human is out at work. Big Hughes looks like a sweetie, love that napping photo! We're sending purrs he finds a wonderful forever home! well look at Big Hughes walk on a leash like it is no big thing.. way to go!